Loadit surreptitiously enters target computers and takes them hostage. This infection will announce it presence on your machine by taking hold of programs and files, thereby preventing your access to them. Loadit also displays a fake security notification by a law enforcement organization, trying to convince you that you are about to be charged for criminal offense unless you pay the specified amount of money. You should take all the necessary tools to remove this infection if you want to regain complete control of your system. Read this article if you want to learn more about this ransomware and why it is particularly dangerous. It is known that Loadit belongs to the Ukash family of infections which is known to consist of such Trojans as FBI Virus, GVU Virus, and other threats, that are based on the tactic of pushing computer users into a corner by displaying fake messages with criminal charges. Even if you do not have a criminal record, still these messages might seem persuasive enough, especially when followed by lock-down of your system. However, we suggest that you do not allow yourself to be intimidated; on the contrary, take all the necessary steps to remove Loadit from your system immediately. There are several ways how Loadit slithers onto to your computer. It might infect your system when you download software updates from unreliable sources, or open attachments or follow the links that come with spam email messages. This Trojan might also be uploaded on your machine by other malware, thus it is important that you do not delay and equip yourself with the most powerful antimalware software in order to delete not only Loadit, but additional infections as well. You will know that your computer is infected with this ransomware, because you will not be able to open any programs or execute any commands. 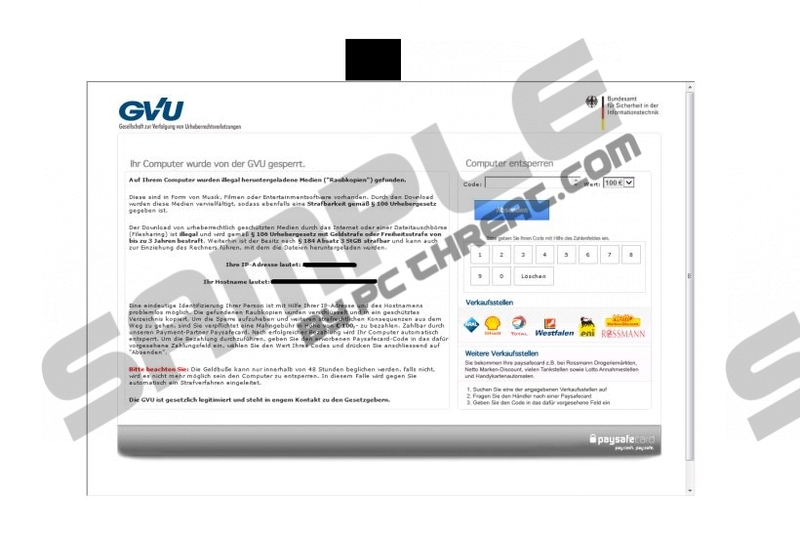 Even if you restart your machine, you will still keep seeing the false “Ihr Computer wurde von der GVU gesperrt” notification on your screen. The message is in German, so computer users who do not know this language might not even understand what is happening with their systems. This German notification states that your computer has been on locked down for the illegal content that has been found on your machine; i.e., you are being accused of downloading music or video files illegally, and thus violating the federal Copyright Act. Bear in mind that this scare tactic is very effective because many computer users have downloaded something illegally at least once in their lifetime. So, the message clearly warns that you need to pay a fine of €100 if you want to avoid the supposed sentence. However, as all these accusations are bogus, do not succumb to the aggressive tone of the requirement and do not engage in any monetary transactions, instead concentrate on following the instructions below to remove this ransomware right now. Loadit is an infection that was designed to target computer users in Germany; however, as you see, it has already started slithering into the systems in the English-speaking part of the world, too. The process of removal is rather difficult, and this is why it is important to have SpyHunter, which is known to be able to remove this infection. To delete Loadit manually you will need to copy the installer of the antimalware program to your USB drive, and then restart your machine in the Safe Mode with Command Prompt. This way you will be able to install SpyHunter on your computer, thereby allowing this tool to neutralize Loadit once and for all. Press the Power button, hold the Shift key and click Restart. Go to Troubleshoot, and then Advanced options. Click Start Settings and press Restart. Press F6 to load Safe Mode with Command Prompt. Type “cd”.. in the C:\Windows\system32 line and press Enter. Enter “explorer.exe” in another line and hit Enter. Install SpyHunter from USB drive. Press and hold F8 as your computer restarts. Choose Safe Mode with Command Prompt and press Enter. Type in “cd” next to C:\Windows\system32 and press Enter. Enter “explorer.exe” in the next line and press Enter. Install SpyHunter from your USB drive. Enter “cd” in the C:\Windows\system32 and press Enter. Type in “explorer.exe” in the next line and press Enter. Quick & tested solution for Loadit removal.